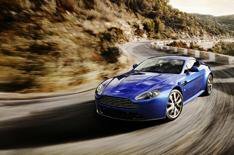 Aston launches V8 Vantage S | What Car? Aston Martin has revealed a new hot member of its Vantage family, the V8 Vantage S.
The S will be available in coupe or roadster form, and slot between the 'standard' V8 Vantage and the range-topping V12 version. A retuned version of the V8's 4.7-litre engine will provide 430bhp up 10bhp on the standard powerplant while drive will be delivered through Aston's new seven-speed semi-automatic Sportshift II gearbox with gearchange times slashed by 20% compared with the previous version. The Vantage S also gets a quicker steering rack, larger front brakes, revised suspension, and a Sport button that quickens gearchanges and makes the throttle response more aggressive. With its design inspiration drawn from the company's GT4 race car, styling modifications include a lower front bumper, reworked sills and 19-inch alloy wheels. The V8 Vantage S is available to order now, and is priced at 102,500 for the coupe and 110,700 for the roadster version.